These flavorful Instant Pot chicken thighs are perfect for dinner, while leftovers can be shredded to make delicious low-carb chicken lettuce wraps for lunch the next day. Reach your keto macro goals for the day with this Instant Pot chicken thigh recipe – 28g fat and 44g protein per serving. 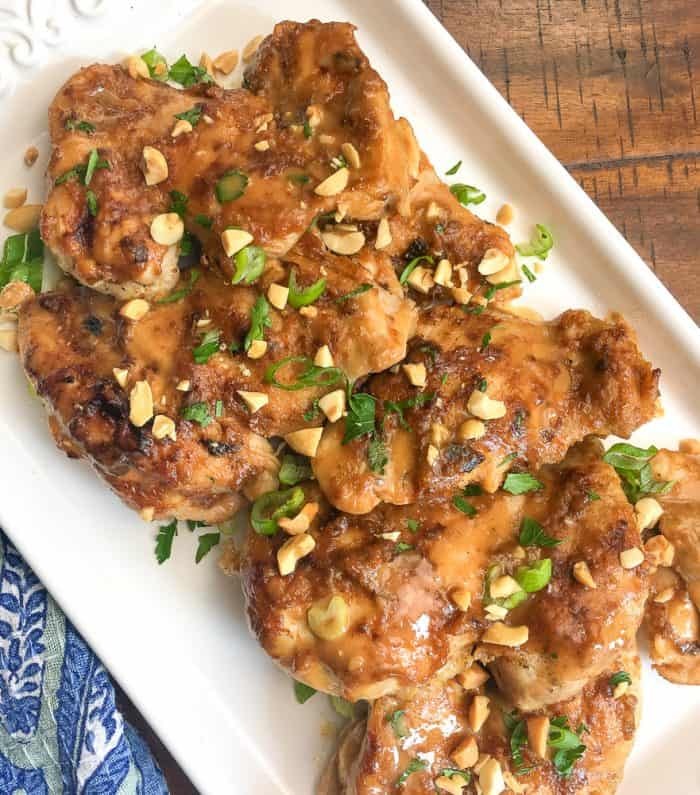 If you have a peanut allergy or are on a paleo diet but don’t want to sacrifice the creamy texture or Asian flavor of this Instant Pot chicken thigh recipe, feel free to sub out the peanuts for cashews instead. One trick for this Instant Pot chicken thigh recipe is to add enough liquid to the peanut sauce prior to cooking. If the sauce is too thick, the Instant Pot may not be able to reach adequate pressure. So, if you decide to add more peanut butter, be sure to adjust the amount of liquid, as well. Add sesame oil to Instant Pot and set the sauté setting to high. Working in batches, if necessary, brown the chicken thighs, approximately 3-4 minutes per side. Repeat this process with remaining thighs. Remove and set aside on a platter. To get the nice browning effect shown in these images, transfer the chicken thighs to a large, rimmed baking sheet lined with aluminum foil after cooking. Brush each side generously with the peanut sauce and place under a broiler set to high for 2-3 minutes or until nicely browned. To get the nice browning effect shown in the photos, transfer the chicken thighs to a large, rimmed baking sheet lined with aluminum foil after cooking. Brush each side generously with the peanut sauce and place under a broiler set to high for 2-3 minutes or until nicely browned. If you like Instant Pot chicken thigh recipes, you’ll love this roundup of 20 Instant Pot keto recipes too!